A mattress is made up of several components. At a minimum, it consists of an outer layer that contains the padding that makes it soft. Modern mattresses contain several layers to keep the person comfortable, safe and supported. 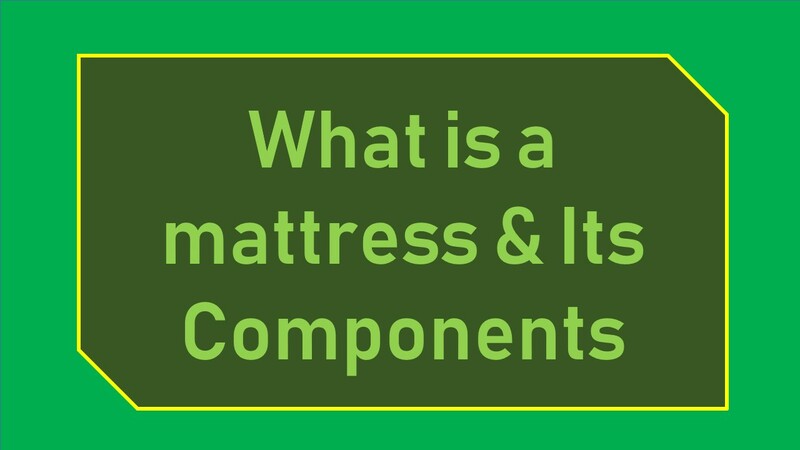 There are several components all mattresses share, even when they are made of different materials. Let’s look at the components that comprise the modern mattress. On memory foam mattresses, this will be called the comfort layer. This is a layer of foam that molds to the body’s shape. For innerspring mattresses, the top upholstery layer is what covers the mattress. This layer is often called ticking or quilting. On some memory foam beds, a stretchy knit “ticking” was put over the memory foam layer so that the bed looks like a standard innerspring mattress. For traditional inner spring mattresses, the puffy pillow-top is the sleep surface. This is the soft layer that makes it comfortable to sleep on the springs. The padding has significant impact on how the mattress feels overall. Some innerspring mattresses have several layers of padding. The padding is separated from the mattress core by a layer of fiber or mesh. In some hybrid mattresses, there is a layer of memory foam underneath the cotton or polyester padding. In memory foam mattresses, the support layer is the layer between the sleeping surface and the core. The foam at this layer is more rigid than the comfort layer so that it offers support for the sleeper and helps the mattress retain its shape. The average mattress has an “inner-spring” core. The mattress may consist of a number of networked coils. As the coil count goes up, so does the cost. The thicker the wires used to make the coils, the firmer the mattress will be. The thickness of the wires is called the “gauge”. The lower the wire gauge, the thicker the spring. More expensive mattresses have pocketed coils where each coil is encased in fabric. These coils are more comfortable to sleep on and are less likely to poke through. For water beds, the water “mattress” is the core. For memory foam mattresses, the core is also called the base layer. This is the most rigid and thickest layer of memory foam.If you have an air mattress, the air bladder is the “core” of the bed. If you have a two sided mattress, the bed has the same upholstery on both sides of the mattress as well as a padded layer on each side. On one sided mattresses, there is no such duplication of the sleep surface on the bottom of the mattress. If you have a one-sided mattress, the bottom of the mattress has a woven, somewhat more durable surface. The Foundation is the base unit. It is typically a timber platform that supports the mattress and lifts it up off the floor. A side benefit of the foundation layer is that it prevents the mattress from getting wet if the room is somewhat flooded and makes it harder for insects to reach the sleeper. If you have an innerspring mattress, your bed foundation is probably called the box springs, since most of them are made from extra heavy-duty springs. Springs make the bed plush, while a wood foundation gives you more support. All wood foundations became more common after one sided mattresses became common after 2000. Grid-top foundations are a mix of steel and wood supports.